This beautiful small ground python is restricted to the forest and savanna regions of coastal West Africa. It feeds almost exclusively on rodents and is considered sacred and hence protected by the people of Dahomey: one of the first treaties between the British and the kings of Nigeria contained a clause specifically assuring the security of various pythons. 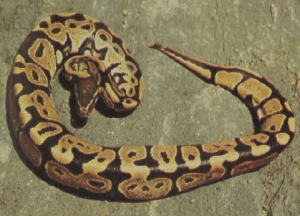 When disturbed, the snake throws its firm muscular body into a ball-like coil with the head resting on the inside, accounting for its popular name. Ball Pythons lay eggs.